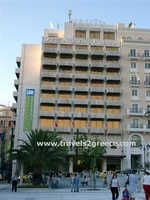 Hotel NJV Athens Plaza is found in the historical square of constitution in Athens, in the heart of regions of enterprises and markets. It is a hotel of category of luxury and is constituted by 182 rooms and the sequences in 9 floors. A short walk is found long Plate, graphic old fourth Athens, and enough from the most historical museum and the regions. The hotel has completely and boasts now the most luxurious sequences with her fascinating opinions citadel. Showcases of these luxurious hotels drew skilfully the rooms entertained. The rooms entertained satisfy all the needs of most exigent travellers of enterprises or free time. The regions lobby are with the hand - drawings of Stones and from the tastefully lounges. The service of operational centres finds itself in the terrace of mezzanines, where the technical equipment and the secretarial services are provided Monday up to Friday. The installations banqueting provide the higher degree of flexibility. If you program a beginning of products, a conference, a dance of dinners or a private regulation, the splendid named rooms of operation can attend for up to 350 individuals. Can in the restaurant of Parliament, where you are specialised in the international cooker as well as the traditional Greek dishes that are prepared by the thinner chefs in Athens. The friendly atmosphere and the luxurious accommodations that you find in hotel NJV Plaza, ensure a pleasant and eve. Gastronomjko restaurant pole Marco, barrier of lounges of explorer, installations Columbus creepier, Banqueting, lifts 2, rent of cars, exchange of currency, washing-machine of coffees and dry - cleaning, explicit compaction, that (near in the hotel), service of rooms of 24 hour, secretarial services (from 09,00 until 17.00), computer lap-top with the access of Internet, fax, and printer, mobile telephone, sauna, rooms of meetings, familial rooms. The classic Greek decoration styles, completely being air-conditioned, EN modern bath of sequence with the telephone, direct telephone of tables with the system of phonetic post, complete mirrors of length, clock of alarms of/radio, channels of music, colours the satellite TV with in the interior television, mini barrier, the floor in the maximum windows, the citadel and the opinion of Parliament, private balcony.